Ss. 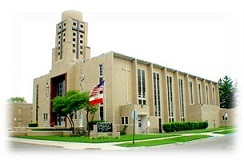 Peter & Paul Church (7685 Grandville Ave.) announced on their Facebook page yesterday evening that their Administrator, Father Jerry Pilus, has been incardinated into the Archdiocese of Detroit. Effective immediately, Father Jerry is now the Pastor of Ss. Peter and Paul as well as St. Suzanne/Our Lady Gate Heaven. Congratulations, Father Jerry, and welcome to the Warrendale family.